BBC Worldwide have issued a press release for their new game, The Mazes of Time, just released on the Apple platform. BBC Worldwide announced today that its Doctor Who: The Mazes of Time App is available now on the App Store for iPhone, iPod touch and iPad, and will be available on Google Android in 2011. 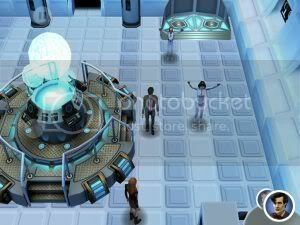 The action puzzle adventure game features the Doctor and his companion Amy Pond travelling through time and space to defeat infamous enemies, solve devious puzzles and restore peace. Featuring Weeping Angels, Daleks, Cybermen and Silurians, the game allows users to play as both the Doctor and Amy Pond, utilizing their unique skills and abilities to solve challenges. "Coming to the App Store is a landmark moment for the Doctor Who franchise," said Robert Nashak, Executive Vice President, Digital Entertainment, BBC Worldwide. "We look forward to bringing users, and fans of the show, an exciting and interactive experience that they will enjoy." The Doctor Who: The Mazes of Time App available for £2.39 (iPhone and iPod touch) or £2.99 (iPad) from the App Store on iPhone, iPod touch and iPad, or at www.itunes.co.uk/appstore. The launch of the app coincides with this year's Christmas special, Doctor Who: A Christmas Carol, airing on BBC One on December 25 at 6pm. Doctor Who, the BAFTA award-winning series is one of BBC Worldwide’s top global brands, airing in over 50 territories worldwide.